Last Thursday, Maren met up with cinephile and video artist John A. Douglas whose works reference familiar Australian landscapes, narratives and cinematic images. John A. Douglas talked about his obsession with The Shining (Kubrick, 1980) and how a love of cinema informs his video artworks. We talked about masculinity and the problems of gender inequality for the psyche of the Australian male with alcoholism, violence and suicide being some of the results thereof. Douglas also spoke about the heightened sense of anxiety felt in our relationship with the vast Australian landscape and how art and cinema express it visually. His work Strange Land Vol. 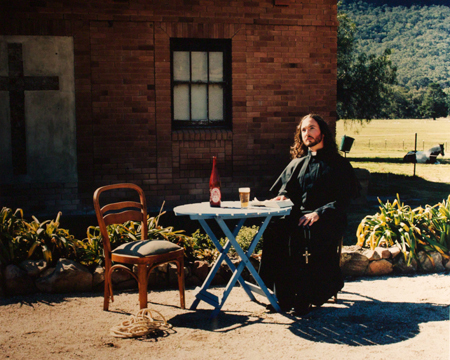 1, now showing in Melbourne, tells tales of mining town Glen Davis through placing historical figures in arresting, almost alien, landscape shots. The work explores historical narrative through a ghost miner, a priest and others related to incidents in the town and around the mine site in the early 1950s. The work features artists Liam Benson, Sari T.M. Kivinen and John A. Douglas himself in various guises, with a soundtrack composed by Deborah Petrovitch which we heard a little of on air. 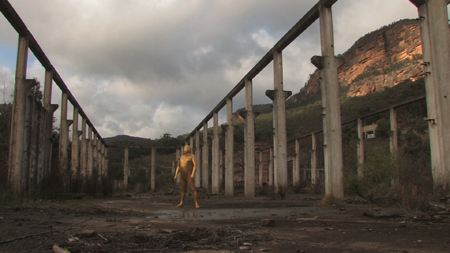 John spends ten hours a day on dialysis, a very time consuming and frustrating process which he underwent live as part of became a part of his performance work Body Fluids II, also accompanied by landscape cinematography including his figure wearing a gold full-body suit, in which he was blind to the outside world. With an emotional expression of physical suffering and frustrating medical procedures inspiring art much in the same way Kahlo’s work was intensely informed by her own suffering, combined with the Beuysian imagery of a body swathed in gold, Douglas uses this stunning visual to become a kind of beautiful cyborg demonstrating the relationship between man and machine. To view John A Douglas’s works, visit his youtube channel and stay tuned for upcoming shows by checking his Chalk Horse website. Also! Your weekly dose of alternative arts and culture now has a twitter account where we’ll keep you informed up to the minute on local Sydney alternative and underground artists, shows, news and events in the world of art, theatre, film and writing! it’s @SomethingElse89 follow us!